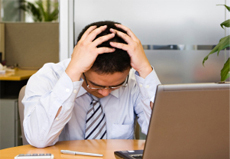 Sometimes it feels like the more we rely on the internet, the more unreliable it becomes. But you may not realize that you actually can achieve better web performance and speed–with the computer and internet connection that you have now. That’s because much of what impacts your web speed is not just related to your hardware or your type of internet connection, but is tied to a set of critical Windows configuration settings that impact speed. With all that we do on the web these days—at work, in school, and for fun—no one has the time or the patience to wait on an agonizingly slow internet connection. That’s why iolo created NetBooster® and included it in System Mechanic’s battery of 50+ performance and repair tools. With a simple step-by-step wizard suited to any technical level, NetBooster makes it easy for you to reach maximum internet performance. 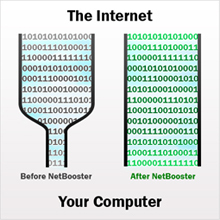 And instead of buying an expensive, brand-new computer or opting for pricey cable/DSL upgrades, with NetBooster you can get better web performance out of your existing system and be speeding down the internet highway with just a few clicks. How does System Mechanic’s NetBooster work? It automatically tailors your computer to suit your internet connection by safely adjusting the key settings that affect network and internet connection speeds. Computers come from the manufacturer with certain operating system configurations already set. But how often does “one-size-fits-all” really fit? These preset configurations are not necessarily the best settings for your specific connection type. 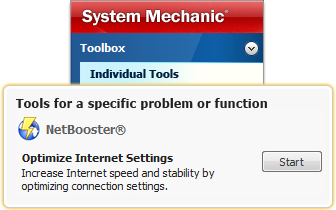 Instead, like the perfect pair of jeans or a suit tailored to your exact measurements, System Mechanic’s unique NetBooster® technology can customize settings to make your web connection a perfect fit for your PC. And rest assured, NetBooster works with any type of internet connection and on any Windows operating system, including the most recent Windows 8. Click here to view a demo of NetBooster. In System Mechanic, navigate to the Toolbox and then click Individual Tools. System Mechanic’s battery of Increase Performance tools will display. Next to NetBooster, click Start. Answer a few simple questions about your internet connection and click Next. NetBooster will automatically adjust settings to maximize your web speed. and ensure its toggle switch is set to Enabled.